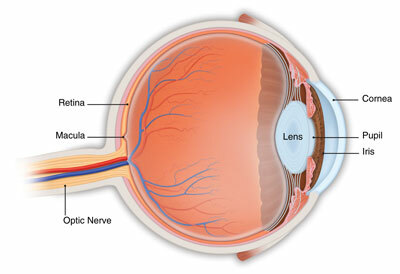 Macular degeneration is a leading cause of blindness in the United States. It occurs when the macula — the part of the retina responsible for clear and sharp vision — “degenerates,” causing a progressive loss of vision. There is wide variation in severity. The “dry” form of macular degeneration is less catastrophic, and studies have shown that proper nutrition and certain supplements in proper doses can prevent further vision loss. The “wet” form is potentially blinding and may be treated by laser procedures, injectable medications, and supplements if it is detected early. Vision lost to the disease is irreversible, regular eye exams are highly recommended. Our doctors can recommend proper vitamin supplements to slow the progression of disease and preserve your vision. For more info on Macular Degeneration please check out the link eyeSmart.